Have you been dreaming of sustaining a beautiful indoor garden in your home or office, but you are worried that you won’t be able to meet the needs of beautiful blooming flowers or finicky plants? Do not stress. Believe it or not there are plants that do not require a whole lot of care and attention. Succulents are the perfect plant for aspiring gardeners who may forget to water their plants or to give them the attention they need. Succulents are extremely easy to care for and there is a wide range of succulents that can be grown in your home or office that range in style, size and color. Succulent plants are characterized by thick and fleshy leaves, stems or roots and they are known for being able to retain water in dry climates or in dry soil conditions. Succulent plants are always in style and they are grown as ornamental plants because of their unique and striking appearance. Whether you grow individual succulent plants or if you decide to group them together they will add a unique touch of color and design to your home or office space. 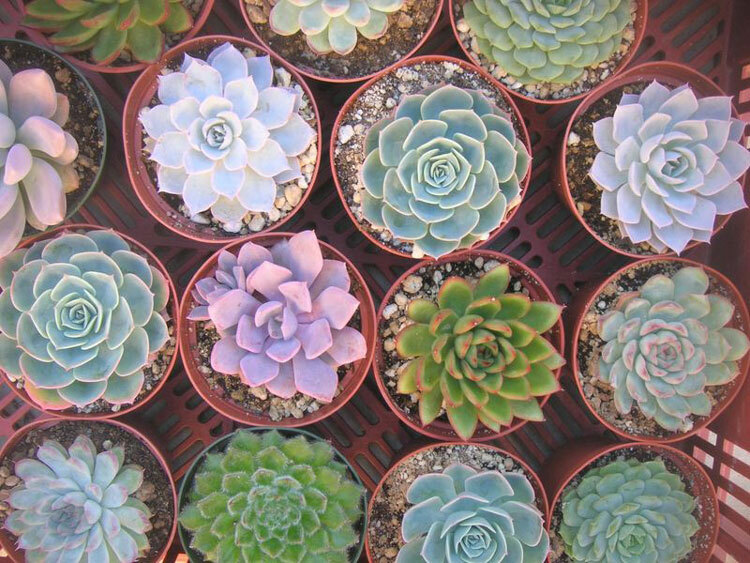 The color variation of succulents is endless – you can find succulent plants that are pink, red, yellow, black and blue-green and many more. They also have various appearances where some may be rounded while others are spiky or needle-like similar to a cactus. Here is a short list of the top five succulent plants for your home or office that are easy to find and easy to care for. Aloe: Aloe Vera is also known as the medicine plant. The healing properties of the plant’s sap have been used to treat wounds and sunburn for centuries. This incredible succulent plant belongs to the same family that garlic and onions belong to and different parts of the plant can be used for internal and external medicinal applications. Aloe Vera contains more than 200 active components including vitamins, minerals, amino acids, enzymes and fatty acids. Aloe also helps with digestion, detoxification, immune system support, cardiovascular health, aids in weight loss, acts as a disinfectant and so much more. Hens-and-Chickens: Hens-and-chickens refers to two succulent plants that are similar, but look different. Both plants produce smaller “chicks” as fleshy leaves that are slightly offset from the mother “hen.” One plant forms flat, flower-like rosettes with rounded edges while the other also forms rosettes that are flatter and more pointed. When grown as houseplants both should be allowed to dry between watering because over-watering causes rotting. Although these plants may look tough due to their fleshy and pointy nature they can be easily scarred if water touches the foliage of it they are heavily bumped. Snake Plant: Snake Plants are among the most neglect tolerant succulents you will ever find. There are even stories that talk about forgotten snake plants that come back to life upon a light watering. Snake plants are characterized by long, pointed leaves that grow with patterned markings reminiscent of a snake. Snake plants are tolerant of low light and don’t need to be watered often. Pincushion Cactus: Pincushion cacti are among the most common cacti grown in the home. Most species come from Mexico where they thrive in the full sun. These plants remain small and they take the form of a small ball or clump and they tend to flower indoors. The spines of the pincushion cactus are hooked at the ends and are difficult to pull out of the skin. This plant requires full and direct sunlight and needs very little water. The soil needs to dry out almost completely between watering and the plant does not need water during the winter. Christmas Cactus: The Christmas Cactus is a beautiful flowering cactus that needs little water before it blooms, but requires more attention when the flowers bloom. The plant needs a light fertilizer three times during summer in order to help it bloom and it requires cooler temperatures during fall. To keep the plant healthy make sure to pinch off stem segments that are ready to fall off. There are wide ranges of succulents to choose from to decorate your home or office. These plants vary in color, size and style and require very little care. Succulents are tolerant of neglect, but they thrive with attention. Ready to Design Your Space with Succulents? If you have any questions about succulents or if you would like to learn about what succulents would look best in your home or office make sure to connect with our expert team at Interior Gardens. We would be more than happy to offer a full assessment, personalized suggestions and a care plan for your flowers.